Daily Slideshow: While the electric blueberry color may not be your thing, the level of quality speaks for itself. If you're spending over $60,000 on a car you'd expect to get a more than decent interior to go with your purchase. For some owners, the love they have for their car knows no bounds but for another group, things could always be improved. Enter Caravaggio, the American tuner shop up north that has garnered attention for upgrading cabins with custom touches for discerning customers. Those shockingly bright blue seats you see are called Tension Blue and are just the first of a few changes that pull your attention. 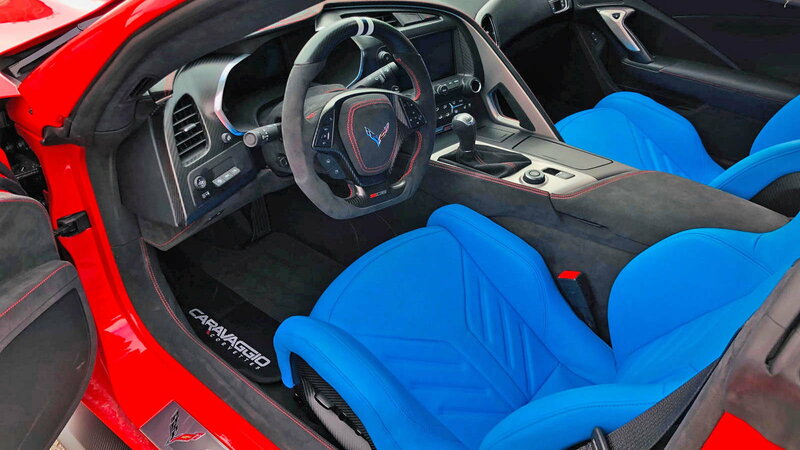 The rest of the interior is finished in Ebony black leather accented with red stitching. 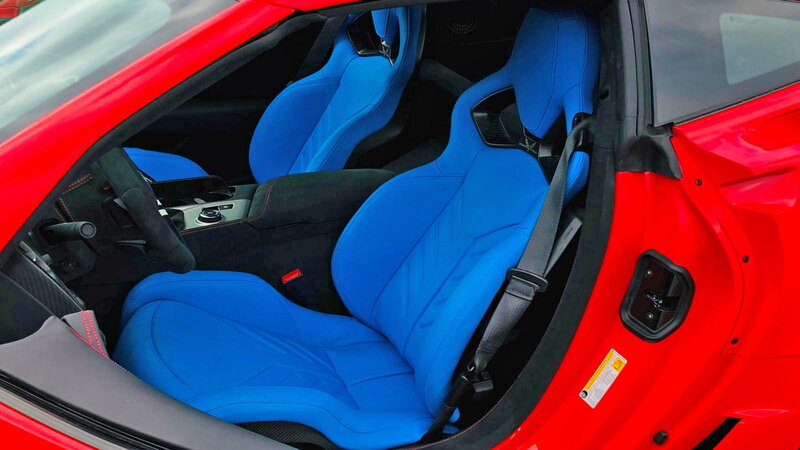 Those Tension Blue leather wrapped seats have finished backs and are custom Sebring racing designs with a matte carbon fiber finish. >>Join the conversation on this Caravaggio Z06 C7 right here in Corvette Forum! 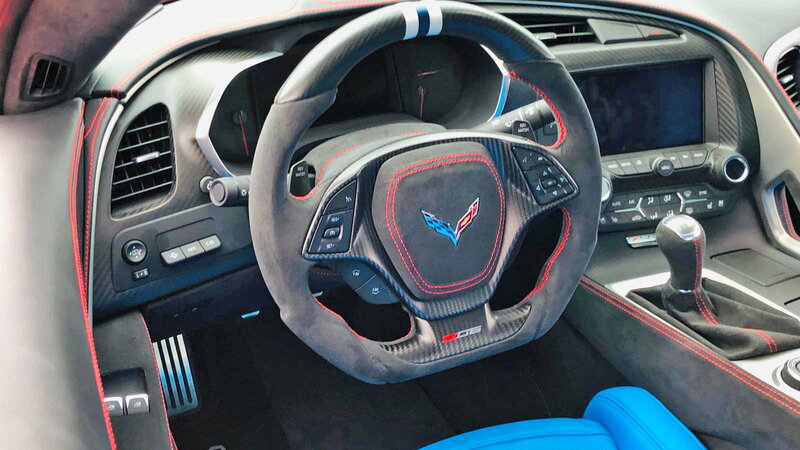 Throughout the cabin are custom leather, carbon fiber trim, Alcantara floor mats, and unique thumb grips on the steering wheel. 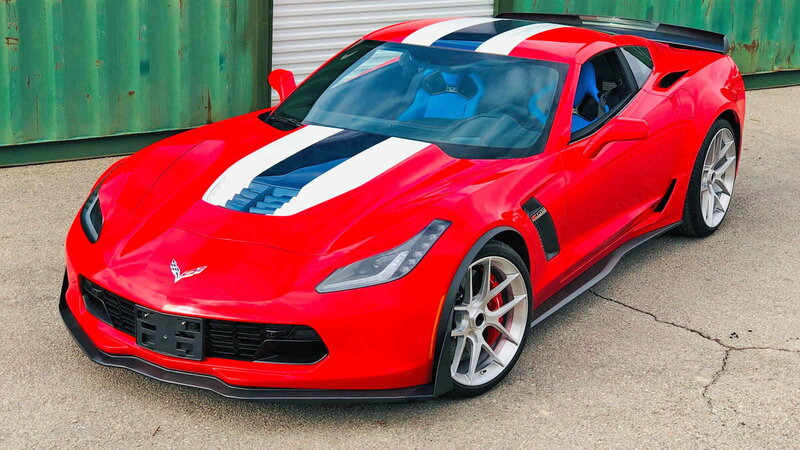 The reason for the wild color scheme is a nod towards the American flag and how the Corvette is synonymous to apple pie. 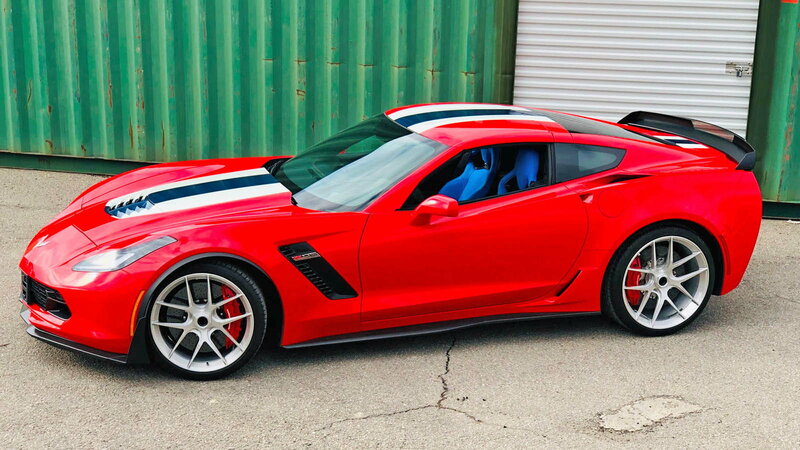 However, if the patriotic homage isn't quite your cup of tea then you can opt for any color combo of your desire through the Caravaggio Corvettes Tailor Made Program. The American theme carries over to the exterior of the car with the red exterior being accented by blue and white stripes on the wheels. The motif is even echoed further on the top of the car with the colors displayed front and center. Those wheels, by the way, are custom center knock-off wheels with 20-inch at the front and 21 at the rear. Now the emphasis on the changes has been cosmetics but Caravaggio still did a bit of tuning work under the hood. The supercharged V8 is now pushing out 730 horsepower thanks to underdrive pulleys, proprietary engine management, cold air intake, and a set of stainless steel long tube headers. For all of this upgraded power and luxury, it'll cost you around $160,000 of your hard earned dollars.